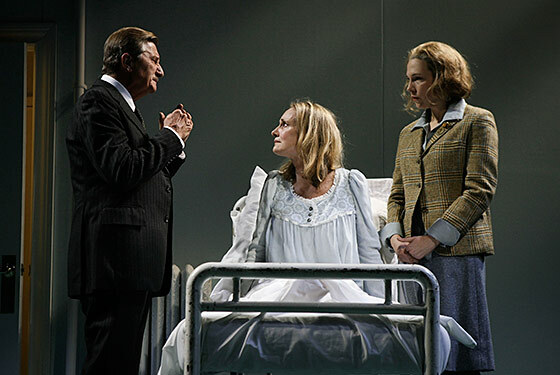 Larry Bryggman, Lisa Emery, and Rebecca Henderson in A Kind of Alaska. A chilled digestif to finish off an uneasy fall theater season, the Atlantic Theater Company’s superb pairing of The Collection and A Kind of Alaska (the first professional New York remount of Harold Pinter’s work since his death in 2008) gives us a taut lesson in the geometry of threat — not to mention a clinic in brilliantly executed theater. Director Karen Kohlhaas opens with The Collection, a vintage ‘62 Pinter one-act that trades in his best-known trademarks: lost souls caught in quiet riptides of malevolence and uncertainty, trying to outflank each other, ultimately outflanking themselves. We’re presented with two uniquely sterile apartments (one modish, one traditional) and two uniquely unhappy couples, James and Stella (Rebecca Henderson and Darren Pettie) and Harry and Bill (Larry Bryggman and Matt McGrath). James, a puffed chest of thuggishness hidden under a hip black turtleneck, believes he’s been cuckolded by Bill, and confronts him, first on the telephone (a phone booth suspended ominously over the stage), then in Bill’s home. Bill first denies the affair, then spins his own, ever-changing version of events, as Stella sprawls, sphinxlike, in her own cryptic misery. The power dynamic shifts, then shifts again, until Harry — whom we’ve nearly dismissed as the sugar-daddy puppet of his boy toy — retakes his flat with a vengeance. Kohlhaas is obviously an actor’s director. Her players are fully, dangerously engaged with each other, and every word spoken (or not spoken, this being Pinter) lands with vicious precision. Not a cubic inch of air feels free of suspense. We see the action through the eyes of a predator, yet, like the characters themselves, we all feel more like prey. But Kohlhaas also has a keen eye for the social architecture of theater, and The Collection is staged with breathtaking clarity. Making excellent use of the Classic Stage’s three-sided thrust, she occludes and reveals her players as if turning up tarot cards. A Kind of Alaska (written in 1982) unfolds in a very different key; the gamesmanship here is one-sided, and pits one very disoriented woman against herself. Pinter wrote Alaska after being inspired by Oliver Sacks’s Awakenings, and his story tracks the same basic arc. Deborah (Lisa Emery) has been “asleep” for 29 years, since she was 16. We meet her shortly after she’s been brought around by a new treatment administered by Dr. Hornby (Bryggman). Deborah’s confusion isn’t unusual (she thinks she’s still 16, she can’t accept the passage of time), but Emery’s delicate, un-self-conscious navigation of the child-in-a-grown-up-body role quickly involves us on levels far deeper than her literal plight. She and Kohlhaas locate in Pinter’s lushly arid text a pinpoint tragedy of human perception, a doomed resistance to the idea of time itself. It’s positively soul-crushing, and yet you want it to go on and on — just the sort of temporal paradox a theatergoer dreams about, but rarely receives. Produced by the Atlantic Theater Company; playing at the Classic Stage Company through December 19.